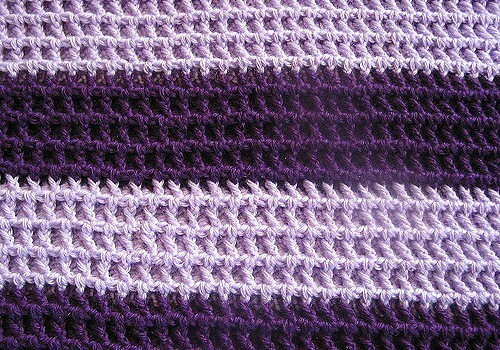 This waffle weave type of stitch pattern, worked in two colors looks amazingly gorgeous. 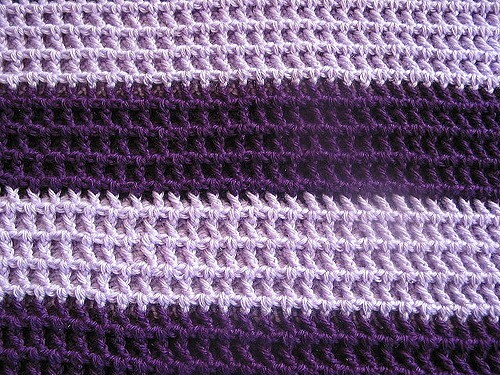 Easy and fast, the Soft Purple Baby Blanket pattern by Samantha Stopple creates a lovely texture. This blanket is so soft and beautiful, any mom or mom-to-be could not wait to see her baby wrapped up in it. Love the color combo, beautiful!! I so love this pattern. I have made a couple so far. This one was made with left over yarn and my grandson wanted it. He loves it! This is my interpretation from the instructions. Any better? row 2: Turn, chain 2, and complete a front post double crochet (fpdc) all the way across to the end, complete a front post double crochet in the turning chain from the row before. Repeat row 2 for the pattern until your desired length. Maybe this pattern will work with that yarn, then. I have not used a Caron cake yet. Can quite grasp the concept behind them yet.